After travelling by air for just over 8 hours from eastern Canada, we were happy to finally arive in Whitehorse. We would be spending a few days here at both ends of our Circle Route tour. We picked up our rental car and made our way over the the Best Western to check in and freshen up. There were parking meters all up and down Main Street, and the front desk clerk recommended that we pick up a Yukon Visitor parking pass (free and available to anyone who is not a resident of the Yukon) at the Visitor Information Centre (that was our cue to go there next). The balance of our first day was spent picking up groceries (breakfast items, fruit & snacks) at the Real Canadian Superstore, as well as beers at the Liquor Store, and getting generally oriented with downtown Whitehorse. We would top up again in Whitehorse before continuing on our Circle Route since shopping options could be quite limited, and even non-existent, in some of the smaller communities along the way. We dined that night at the Klondike Rib & Salmon, a spot that is very popular with the cruise ship shore excursion crowd, and later made our way over to the riverfront path along the Yukon River for an after dinner stroll. We had originally planned to take in the Hà Kus Teyea celebration in Teslin on our 2nd day in the region, but after a long travel day the previous day, the 2 1/4 hour trip each way seemed less appealing. Instead, we opted to hike on Gray Mountain, which is only a few minutes outside of town, and offers great views of Whitehorse and the surrounding area. A cell phone tower access road allowed us to drive most of the way up, leaving only a 600′ elevation gain to complete on foot. The access road was largely navigable with our low clearance Ford Focus, but we had to ditch the car a few hundred meters before the end of the road when we came upon a particularly rough, and narrow, stretch of road. We capped off the day with dinner at Earl’s, and a trip out to Schwatka Lake afterward to watch float planes take off. Kelly and I went our separate ways on the 3rd morning with she opting for cycling around town while I headed 45 minutes south toward Carcross to hike on Caribou Mountain. The Caribou Mountain trail involved a 3,200′ elevation gain and an 8km round trip. I was prepared for a bear encounter and had my bear spray and bear bangers with me, but only encounterd mountain goats (from a distance) along the way. Kelly was concerned about me doing a solo hike, so I ensured that I didn’t spend too much time taking pictures and focussed on getting up and back in a reasonable time. I managed to complete the hike in 4 1/2 hours and was back in town by 2:30pm, just in time to join Kelly for her 2nd cycle tour of the city! Our final 3 days in Whitehorse were less physical, and allowed us to visit the city on foot, and do some souvenir shopping. Some of our other stops included the MacBride Museum and North End Gallery. Whitehorse has contrasting architecture with some buildings like City Hall harkening back to the 1950’s, and others like the legislature and visitor centre having a modern, natural look and feel. Neon signs are still alive and well in this town! We were encouraged to visit the Whitehorse Fishway, as well as Miles Canyon, by local friends we had met while on our day trip to Juneau. The fishway was built by the Yukon Energy to allow spawning salmon to bypass the power dam. Interpretive panels, and an art exhibit by local schoolchildren, kept our interest during our visit here. Miles Canyon, a little further upstream from the power dam, has trails and a bridge that allow for closer viewing of the river as it squeezes through the canyon. On the morning of our departure, we made a very quick tour of the SS Klondike that did not do justice to what it had to offer. 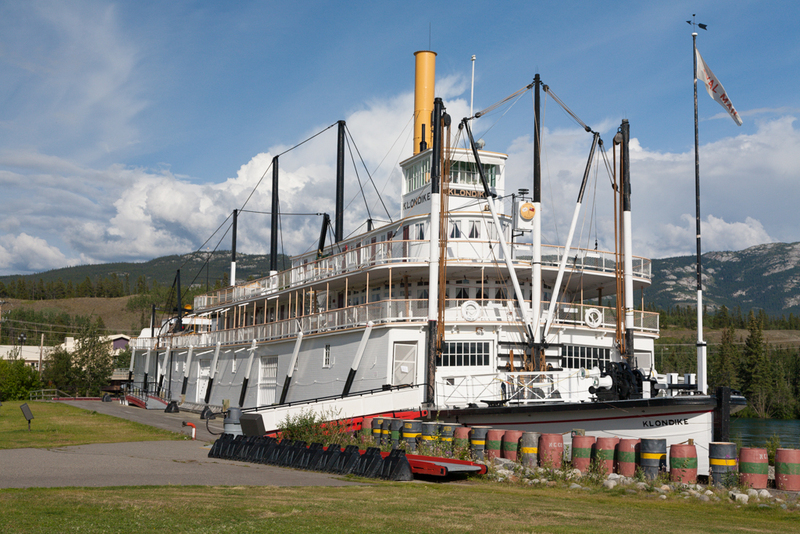 The SS Klondike is a restored paddlewheel boat that is now a national historic site resting on the banks of the Yukon River. Freight and passengers were carried between Whitehorse and Dawson City between 1937 and 1955. You can read more about our journey along the Golden Circle Route here. Caribou Mountain: After an elevation gain of 3,200′ – Summit views! Enjoyed seeing your pictures and information. My husband and I are planning a trip to the Yukon likely early June 2018. It’s interesting to see where you have been, where you stayed and ate. All this is great when planning a trip. Thank you for your comment Ellen. Your words are exactly what inspire me to post this kind of content. We hope to get back to the Yukon someday soon, and hope that you have a fantastic trip!